One Momma Saving Money: The Star available on Digital on February 6 and Blu-ray & DVD on February 20. The Star available on Digital on February 6 and Blu-ray & DVD on February 20. From the studio that brought you MIRACLES FROM HEAVEN & CLOUDY WITH A CHANCE OF MEATBALLS comes the timeless tale about faith, friendship, and the importance of believing in yourself. 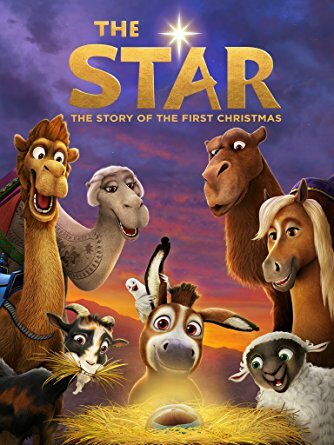 AFFIRM Films and Sony Pictures Animation’s THE STAR arrives for the first time on Digital on February 6 and on Blu-ray + DVD + Digital February 20 from Sony Pictures Home Entertainment. The heartwarming animated comedy follows a small but brave donkey named Bo (voiced by Steven Yeun, “The Walking Dead”), who yearns for a life beyond his daily grind at the village mill. One day he finds the courage to break free and finally goes on the adventure of his dreams. On his journey, he teams up with Ruth (voiced by Aidy Bryant, “Saturday Night Live”), a lovable sheep who has lost her flock and Dave (voiced by Keegan-Michael Key, Friends From College), a dove with lofty aspirations, along with three wisecracking camels voiced by Tracy Morgan (“30 Rock”), Tyler Perry and Oprah Winfrey. Bo and his new friends follow the star and become accidental heroes in the greatest story ever told. Sony Pictures Animation produces a variety of animated and family entertainment for audiences around the world. The studio is following its worldwide comedy hits—the record-breaking monster comedies Hotel Transylvania and Hotel Transylvania 2, the hybrid live action/animated blockbusters The Smurfs and The Smurfs 2, and the mouth-watering Cloudy with a Chance of Meatballs movies—with the fully animated reboot Smurfs: The Lost Village available on digital and Blu-ray now; a surprising and comic take at the secret world inside our phones with The Emoji Movie now on Digital HD, Blu-ray, DVD, and 4K Ultra HD; the inspirational The Star currently in theaters. Next will be Hotel Transylvania 3: Summer Vacation from director Genndy Tartakovsky in July 2018; and the groundbreaking animated feature Spider-Man: Into the Spider-Verse from the minds of Chris Miller and Phil Lord in December 2018. The studio, in conjunction with Aardman Animations, has produced two critically acclaimed feature films: the CG-animated family comedy Arthur Christmas; and the Academy Award® nominated stop-frame animated high-seas adventure, The Pirates! Band of Misfits. In 2007, Surf's Up also received an Academy Award® nomination for Best Animated Feature Film; a sequel entitled Surf’s Up 2: WaveMania is now available on digital and DVD. The division, whose first feature film Open Season led to a very successful movie franchise including the brand new Open Season: Scared Silly now available on digital, DVD and Blu-ray, was founded in 2002. Sony Pictures Animation is a division of the Sony Pictures Motion Pictures Group.